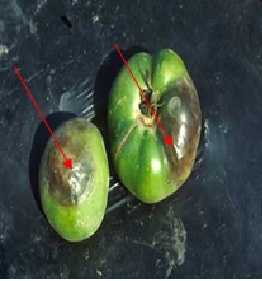 Problem Description Water soaked lesions appear on leaves, stem and fruits. 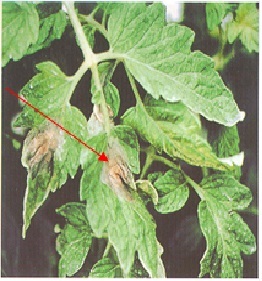 Water soaked lesions appear on leaves, stem and fruits. Under humid conditions, the disease spreads very fast giving blighted appearance. Whitish mycelium of the pathogen can be seen on the lower surface of the leaves, around the margin of spots. The spots on fruits are olive coloured and these may enlarge to cover the entire fruit. Finally the infected fruits rot.